CUTS CHLORINE CONSUMPTION BY UP TO 25%! 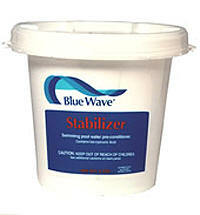 Stabilizer pre-conditions your pool water to make chlorine last longer. Use at the beginning of each season to protect chlorine from the sun’s damaging effects and increase its effectiveness. Cyanuric Acid. Dosage: 1-2/3 lbs. per 10,000 gallons.